ePublishing Knowledge BaseePublishing Knowledge BaseePublishing Knowledge Base Creating and Managing EventsHow do I manually add a new event attendee? Access free or paid event attendee registrations under Attendance in the Event Manager. Learn how to collect registrations in this article: How do I create a registration form for an event? This article covers how to add new event attendees manually. 1. 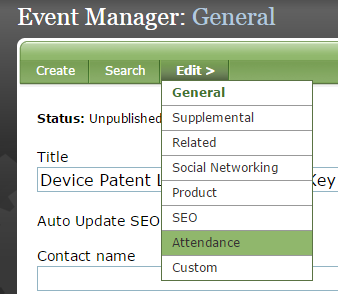 In the Event Manager, click Attendance under Edit. 2. Click Add an Attendee. Zoom: Click Add an Attendee. 3. Enter the attendee's information. 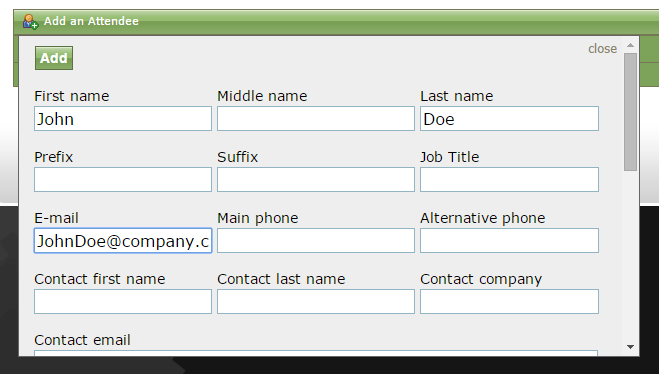 Whether any of the fields in the above form are required is determined by a system setting. Here are a few notes on some of the fields above. Group Reference: This field can be used for any purpose you would like. This field is frequently used for table assignments or block-ticketing seating assignments. Contact's Information: This is often used for the person who purchased or registered the attendees. If an attendee registered herself, this isn't used. Cost: This represents the cost of an individual ticket and when someone purchases a registration, is populated by the unit price set when you set up the registration form. If free, this is $0. This can be overridden. 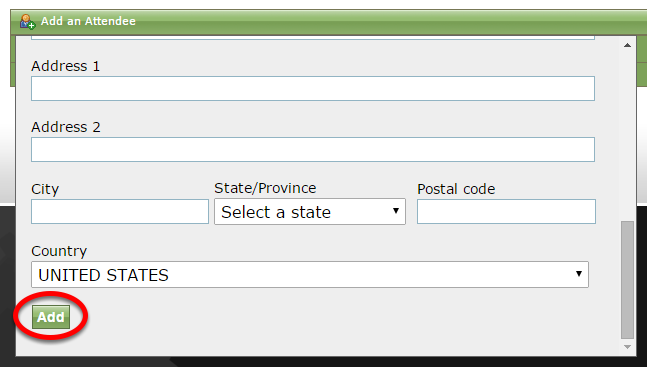 Address 1 and 2, City, State/Province, Postal Code, Country: These are for the contact's address, but will be recorded in the attendee's record. 5. When the attendee was successfully added, a yellow SUCCESS bar will appear. Zoom: When the attendee was successfully added, a yellow SUCCESS bar will appear. 6. To edit the attendee's record, click Edit. If a new attendee's information is similar, you may want to duplicate the record for quicker updating. Or click Delete to remove the attendee's record. Prev: How do I add sponsors to an event? Next: How do I update multiple event attendee records at the same time?